20.10.07 The new official website of Delco Angelov released. 10.10.07 The video documentary about Delco aired on the Macedonian National Television. 27.09.07 Where and when is the next extreme marathon Delco is going to cycle? 16.07.07 Delco Angelov and his "Tour d'Europe 2007" all over the media. 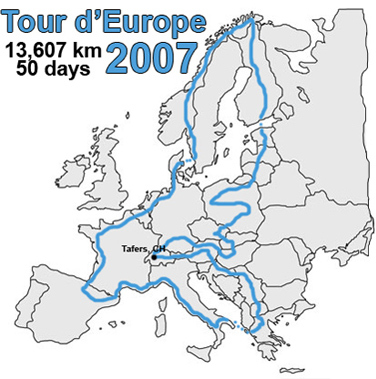 09.07.07 Delco cycled 13,607 km for 50 days and successfully finished his "Tour d'Europe 2007" marathon.